8 Steps I’m Taking to Get Debt Free! Extra Income: I needed to bring in more income. So I’ve taken a part time virtual job so I’m still home and it has made a huge difference. Breaking Down The Bills: I had to get in the nitty gritty of reviewing my balances, the minimum payments, how much I’ll pay if I only play the minimum (which is ridiculous! ), and how many month it will take to pay off the balance. Paying the Debt Off Strategically: I’ve been aiming to pay off any smaller balances in full then taking those minimum payments and applying it to the next debt. Creating a Budget: I am using a David Ramsey budgeting tool called, Every Dollar. I love it! It is a super simple tool that keeps you organized and updated on your progress. Using Cash: Taking a specific amount of cash out helps me keep my spending under control. Once the money is out then that’s it! Tithing: This is an absolute must for me. I’ve set aside a certain amount of money for tithing and this makes me feel so good and determined to get debt free so I can give more to church and to other charities of my heart. Saving for an Emergency Fund: The goal is at least $1000.00 according to David Ramsey’s baby steps and I think that is a good beginning number for those unexpected emergencies. Investment: I’m doing some research, but plan to open a Roth IRA in the next week. I’m super excited about what getting debt free will mean to my family. As of today, I paid off 4 credit cards with a total of $1323.00 and I just started this month. I plan to pay off 3 more balances at the end of July beginning of August with a total of $2778.00 or 2 more balances at $1344.00. I’ll give you guys updates as I hit milestones and I’ll give a snapshot of what getting rid of debt looks like for me. If you want to get pumped up about getting rid of any debt you have watch some of the debt success stories over at David Ramsey. Also, take a look at the Every Dollar Tool, I love it! Update on My Car Pay Off! Basically, I need to pay roughly 332.50 each month to pay it off by December. I’m determined, but the fact that it is at this amount makes me happy and I see the end! I’ll keep updating you on this goal. New Blog Radio Episode Tonight at 6:00 PM EST! I got such a great response on my post 8 Tips on Teaching Your Kids About Money I’ve decided to do a broadcast on the subject. If you want to listen in please go to the link below at 6:00 PM ET. If you want to call in dial (646) 595-4374. Thanks! Call in with your tips! 8 Tips On Teaching Our Kids About Money! Have you ever wished you had learned better money management skills at a young age? I know I do. I’ve gotten a lot wiser when it comes to money, but I still have a way to go to be debt free and in the financial comfortable position I hope to be in. One lesson I did learn that I’m being extremely intentional about is teaching Anya the value of a dollar, how to save and how to give it away as well. Teaching her how to be a good steward of her money at 8 years old will help her later when she’s an adult and in charge of her own finances. This picture is from last year when we took a Girl Scout trip to Hershey Park. My mom gave her some cash to spend and she was quite happy 🙂 She had a lot of fun spending that money and it was her free money which was fine, but I want her to understand that money can either enhance our life and the lives of others or we can become a slave to it. Of course I’m teaching her at a level her 8 year old mind can understand. Anya gets money from our relatives and for doing chores around the house. There are chores that she doesn’t get an allowance for like cleaning her room. But, I want her to learn how to save money so she gets $2.00 a week which I think is appropriate for her age. Here’s how we break it down. Now, she has money saved in her bank at home already and I have a separate savings account for her. So she gives the church a $1.00 on Sundays and she is very happy to put her money in the collection plate. She takes time to fill out the little envelope and it is so sweet what she will write which tickles me pink. I love that she is so cheerful to give her money to the church and she gives more than I’ve asked her to give and will often give to charity, so it probably is more than 10%. Free money is money she can spend. Now, it doesn’t seem like much, but as I mentioned she has about $50 in her bank at home now. Tonight she took some of her money and wanted to buy an accessory for her doll. She ended up not purchasing it because she didn’t really love the glasses. She looked around and was tempted to buy a stuffed animal and a few other trinkets but instead opted to pass and said she’d rather save her money. I could see her figuring out in her head if the purchases were worth it or not. She ended up buying some glue for $1.98 for a craft she’s working on and was happy. Savings is a big one! I really want to emphasize the importance of saving so I’m trying to model it for her and believe me it isn’t easy especially living in the expensive area we live in. But, I’m showing her each week the automatic deposit that is made from my checking account that goes into her savings account, my savings account and our Christmas club account. The idea is for her to visually see how the money eventually grows. 1. Make them earn it! The best way to teach your kids about the value of a dollar is making them work for it. Find chores, errands or whatever you think is age appropriate and make them earn their money! Encourage entrepreneurship whenever you can! If they really want to earn more money challenge them to figure out another avenue to earn those dollars. This can spark all kind of creativity and it is always good to be resourceful. 2. Teach by example. Show them that you know how to save even if it is $5 a week. Any amount you save matters. Be careful what you spend your money on and be generous with it as well. We are the best teaching tool! When they get older let them know some of your money mistakes and teach them what pits not to fall into. 3. Tell them to ask themselves a few questions before making a purchase. Is this a want or a need? Do I love it or just kind of like it? What else can I do with this money? Will I regret this purchase in a few days? 4. Encourage giving. Money at it’s best is used to further the kingdom of God and to help others. Teaching our kids to tithe and give generously ultimately leads to abundance. They are never to young to start! 5. Save, save, save! Open a savings account for them and teach them how it works. ING now Capital One has some great features for kids to learn about saving or you can just give them a piggy bank. But teach them to save and show them the fruit of this habit by showing them their growing balance. 6. Let them spend too! We want to enjoy our money also right? So allowing kids to spend some of their hard earned money is only fair. Believe me, they are much more careful when it is their own dollars they are spending. But let them have fund and enjoy the fruits of their labor. 7. Teach them to stick to a budget. This is more realistic when they are older. But again model for them what sticking to a budget means. If they learn how to budget their money sooner than later the better outlook they will have for their financial future. For example, Anya has a certain amount of money to spend today she understood that once she went over that budget there was nothing left and I wasn’t going to add any extra. That might sound mean, but I want her to learn that once the money is gone it’s gone. It really is that simple. 8. Don’t let them completely blow monetary gifts. When grandma gives $20 that doesn’t mean she gets to spend the whole $20. I expect her to do the same with it that she would do with chore money. Granted there are exceptions such as birthdays or special events, but staying consistent helps build good habits. I’ll be posting more about money and will share with you some of the things I’m challenging myself with to become more financially stable. I would love to hear your tips on teaching kids about money so please share! Saved $65! How/ By Cutting My Own Hair! 1. Dry your hair and make it as straight as possible. 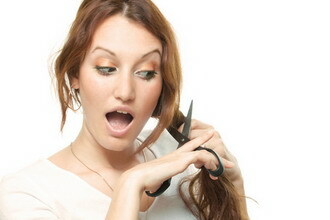 3.Grab a pair of scissors, preferably sharp and hold the ends you want to cut, then snip, snip! 4. Do the same on both sides and there you have it! My hair feels healthier and I saved money! If I need those pesky ends trimmed I won’t be going to the salon I’ll be going into my bathroom! Start A Girlfriend’s Night Out Jar! I have to give Anya a bath in about five minutes, but I had to share this great idea that my friend Alicia thought of that I think alot of us can benefit from. Alicia said she was going to start a ‘Girlfriend Night Out Jar,’ to put money aside for those special nights out with the girls. So instead of buying that third latte that you really don’t need from Starbucks put the $4 bucks in your Girlfriend Night Out Jar and plan a special night with the ladies! Gottta go but I love that idea!!! Thanks Alicia! !